Description: The Early Text of the New Testament aims to examine and assess from our earliest extant sources the most primitive state of the New Testament text now known. What sort of changes did scribes make to the text? What is the quality of the text now at our disposal? What can we learn about the nature of textual transmission in the earliest centuries? In addition to exploring the textual and scribal culture of early Christianity, this volume explores the textual evidence for all the sections of the New Testament. It also examines the evidence from the earliest translations of New Testament writings and the citations or allusions to New Testament texts in other early Christian writers. 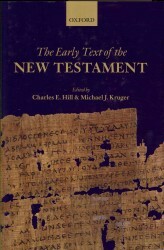 Citation: Amy M. Donaldson, review of Charles E. Hill and Michael J. Kruger, eds., The Early Text of the New Testament, Review of Biblical Literature [http://www.bookreviews.org] (2014).